Is it possible for businesses to have a bottom line that is not profit and endless growth, but human dignity, justice, sustainability and democracy? Or an alternative economic model that is untainted by the greed and crises of current financial systems? Christian Felber says it is. Moreover, in Change Everything he shows us how. The Economy for the Common Good is not just an idea, but has already become a broad international movement with thousands of people, hundreds of companies, and dozens of communities and organizations participating, developing and implementing it. Published in English for the first time, this is a remarkable blueprint for change that will profoundly influence debates on reshaping our economy for the future. "Christian Felber has written that rare article: the genuine game-changer. Easy to read, irrefutable in its principles and comprehensive in its proposals, it's a how-to guide to a better world. At last, it's in English. Don't miss it." --Susan George, author of Whose Crisis? Whose Future? "A timely and important new vision for the purpose of economic activity, moving away from the private accumulation of wealth and towards the common good. A must read for business leaders, economists, activists, civil servants and politicians if we are to have any chance of creating an economy that meets the needs of people and the planet." 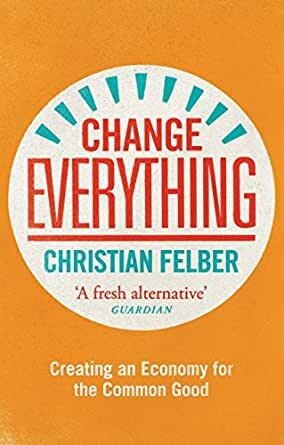 "Felber and his associates have created 'The Economy for the Common Good, ' a utopian vision of society based on community values where altruism is rewarded and political and economic power returned to the people. In Change Everything Felber lays out a plan for this new society, based on the idea that 'all economic activity should serve the common good.' . . . Finishing it, I found myself wanting to live somewhere where the Economy for the Common Good applies, and eager to follow up this book with some action." Very important ideas, turning "modern" (i.e. 19th century) economics on its head. Readable clear explanation of what's wrong and how we might fix it. Congratulations Christian on your Economics for the Common Good model. This is exactly what the entire world needs urgently. Prefer his live interview presenting his ideas, He does provide alor of inspiration for a solution for an untenable status quo. Christian Felber's ideas are phenomenal! An applicable proposition to a much more human economy. Precisely written volume. This economy professor's ideas were actually and successfully applied in the real world. A must read for everybody interested in how to base our economic transactions on prosocial instead of antisocial values. haven't read it totally, maybe first 5 pages...but so far, so good.